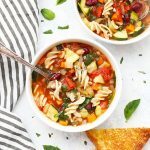 I’ve got everything from creamy butternut squash soups, to spicy soups, to egg drop soup, but I realized I don’t have a classic reseturant-style minestrone soup on the blog. It’s about as full of veggies as it gets! 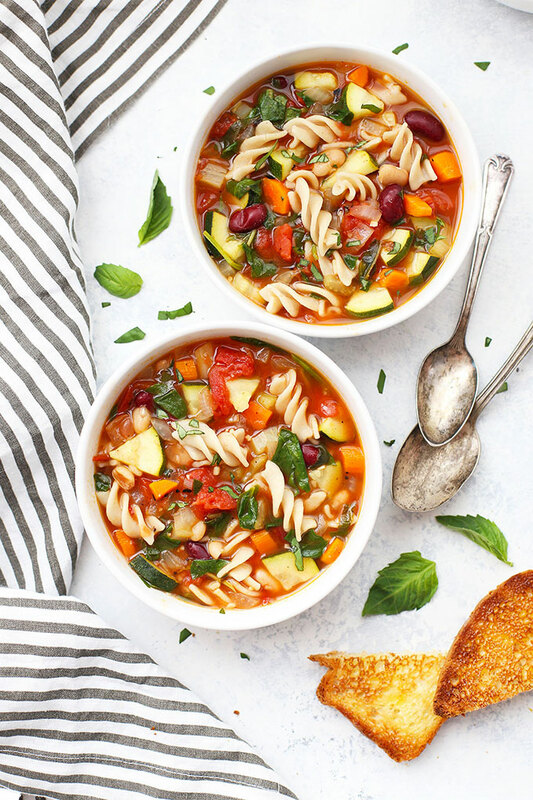 While there aren’t any specific “rules” about which veggies go into a minestrone soup recipe, one thing’s for sure: there are plenty of them! 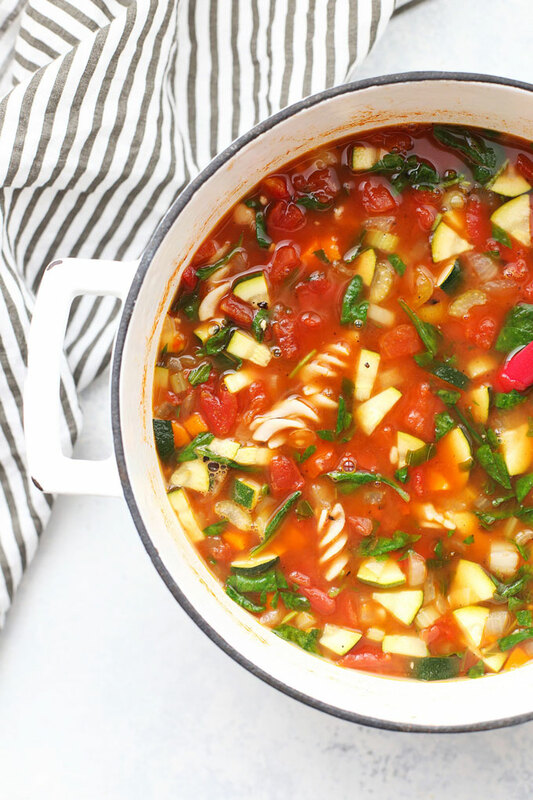 In this version, there are onions, carrots, celery, tomatoes, zucchini, spinach, garlic, 2 kinds of beans, and vegetable broth. It’s easily gluten free. All you have to do is use your favorite gluten free pasta. 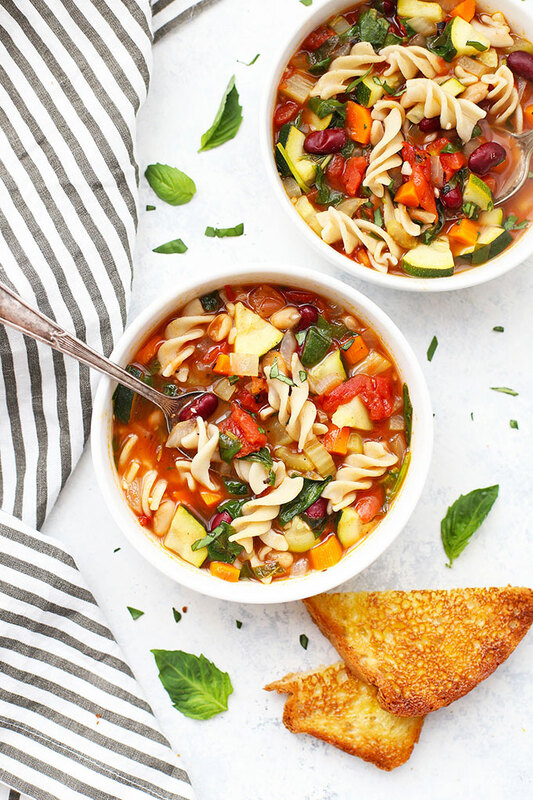 I like small shapes for minestrone, like shells, ditalini, macaroni, or rotini. You could certainly use other shapes of pasta if you prefer. I’ve had great luck with Tinkyada and Jovial brands’ brown rice pastas, and any corn/rice pasta will also work. Not gluten free? No worries. Just use YOUR favorite pasta. I like ditalini (small tubes), oricchiete, macaroni, or shells. It’s flexible and forgiving. I love recipes that are easy to change. This one can easily take more veggies–feel free to add some bell peppers, kale, fresh or frozen green beans, or even finely diced potatoes. Or, swap out the beans for whatever kinds you have on hand. 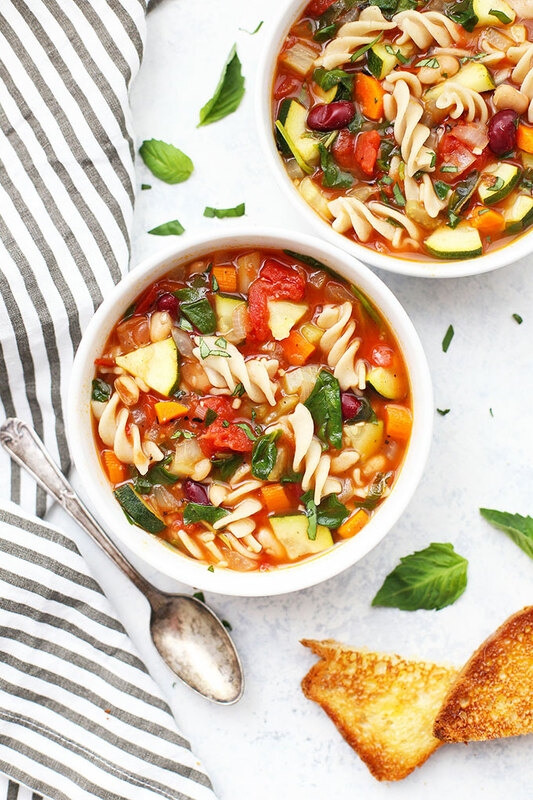 Want to use chicken broth instead of veggie? Go for it. Avoiding grains? Skip the pasta. See? Easy. A delicious green salad for a soup + salad vibe. Try a simple “house” salad with creamy ranch or balsamic vinaigrette, or this Italia salad with Lemon Basil Dressing. Or, go big and make a giant fall cobb salad with all the fixings! Bread, rolls, or breadsticks. We’ve had good luck with Schar & Udi’s gluten free rolls. Otherwise, we toast up some Canyon Bakehouse bread. If you’re not GF, I used to eat rosemary or olive bread with this a lot. Pump Up The Protein! This recipe is vegetarian as written, but you can also add additional non-vegetarian proteins if you like. We’ve added leftover cooked chicken (grilled is especially nice! ), Italian sausage or sliced Italian-style chicken sausages, or swapped out the veggie broth for homemade bone broth. Other Veggie Ideas – Like I mentioned above, this recipe can easily take some playing with. Feel free to add extra veggies or swap in the ones you have on hand. Bell peppers, green beans, kale or other greens, and finely diced potatoes are all yummy. Make-Ahead Tips. This is a great recipe to make ahead. It tastes better with time and can freeze well. If you plan to freeze it, I recommend NOT adding the pasta until you plan to eat it as pasta’s texture doesn’t hold up as well from the freezer. Cook pasta according to package directions. Drain and set aside. Meanwhile, make your soup. To make the soup, heat olive oil in a Dutch oven or large soup pot over medium heat. Add onion, celery, and carrots, and sauté over medium heat 5-7 minutes, or until veggies are partially softened. Add garlic, tomato paste, and a bit of salt and pepper (as desired). Stir to coat the veggies. Add red and white beans, tomatoes, broth, and basil. Stir to combine. Bring soup to a bubble and simmer about 5 minutes. Add zucchini, and simmer about 5 minutes longer, or until just softened. Stir in spinach and cooked pasta. Stir to wilt the spinach. Taste and add additional salt & pepper as desired. How much basil did you add? It’s not in the ingredients list but in the directions. Making this tonight! Thanks! Sooo good! I used quinoa instead of pasta because it was all I had and it’s soooooo delicious. Beautiful recipe!!! Made a huge pot of this before my family came into town and everyone loved it!!! Thank you – will be making again very soon!!! Hooray! I just love hearing that! Thank you so much for sharing. Julie – I recommend adding the cooked pasta RIGHT before serving the soup for best results, since you’re right. All the GF pastas I’ve tried continue to absorb liquid as they rest in the soup so they do get soft. I’ve had good luck with Tinkyada or Jovial brand brown rice pastas. The heartier shapes (like rotini) have done well for me! Wishing you friend and her family so much peace and best of luck during this difficult process. My mom underwent aggressive chemo when I was a teenager, and having friends bring thoughtful meals made our days so much brighter! Can this be cooked in the crockpot? If so how long would you recommend! Thanks!